A couple of years ago, I was fortunate to open a correspondence with Nigel Brooks who told me of the Peninsular memoir he possessed of a private in the 47th Foot. Memoirs by other ranks are relatively rare (although getting less rare as more are discovered and published) and the only previously recorded memoir of the services of the 47th is that of John Harley, which was privately published (only 400 copies) in 1838 and remains very high on the editors personal wish list for his collection! I was therefore of course very interested. Nigel kindly supplied me of a copy of the memoir but had some reservations over publishing the material. I am very glad that following further correspondence, I have been able to satisfy Nigels and his brother Martins concerns (who jointly own the memoir in a little battered A 5 booklet) Adam originally joined the Corps of Royal Artillery Drivers but soon absconded, having found that he did not work well with horse teams. 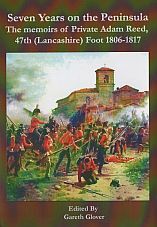 He re-enlisted into the 2nd Battalion 47th (Lancashire) Regiment of Foot with which corps he served at Cadiz (where he fought at the Battle of Barossa); witnessed the end of the Siege of Tarragona; fought at the Siege of Tarifa; joined the march to Madrid including the capture of Seville; suffered the subsequent retreat to Portugal; fought at the Battle of Vitoria (where he was wounded); stormed San Sebastian (2nd Storm); and fought at the Battles of Nivelle, Nive and finally the Sortie from Bayonne. Returning home in 1814, he was swayed by the wrong crowd and deserted to his parental home, but was eventually reported and punished by 100 lashes. He finally retired with a small disability pension in early 1817 and settled to raise a family back in his native Essex. It is a fascinating story and fully backed by all the evidence as an authentic account. It was clearly written later in life from previous notes, but the story is still fresh and absorbing.